Medical Imaging is a department of the College of Medicine. It also is an integral element of the Saskatchewan Health Authority. We also participate in training opportunities for medical, dental, nursing, technology and postgraduate learners. A broad range of research activities are also being pursued by faculty, postgraduate students and residents. The Department of Medical Imaging Services within Saskatchewan Health Authority is committed to improving the healthcare of patients by providing excellence in diagnostic imaging and treatment. We are dedicated in setting standards of excellence of radiological care and training of personnel including residents, appropriateness criteria, clinical and imaging protocols, and outcome expectations. We promote scientific inquiry among its members for the advancement of imaging through clinical research, basic biomedical research and technology assessment, and clinical practice guidelines and outcomes research. Our goals are that its members provide comprehensive diagnostic imaging by the most appropriate radiological evaluation and thus deliver the highest professional quality of care with optimal patient outcomes. The undergraduate experience includes exposure to all facets of Diagnostic Radiology, with some exposure to Interventional Radiology and Nuclear Medicine. For the most part is an observership opportunity. The weekly schedule is meant to expose the student to a range of the modalities with staff and residents and students are expected to attend the scheduled academic teaching sessions for the residents, held every Wednesday afternoon in the Spencer library located in the department near CT. On "bank day" weeks, these sessions are held Friday afternoons. Academic Faculty participates in the education of undergraduate medical students in several facets. This includes view box teaching in the department. As well, the faculty participate in the JURSI academic Half-Day Teaching and Systems-based lectures. The undergraduate elective experience includes exposure to all facets of Diagnostic Radiology, with some exposure to Interventional Radiology. Nuclear Medicine observerships must be arranged with the Nuclear Medicine department directly. For the most part, the elective is an observership, with opportunities for "view box" teaching. The weekly schedule is meant to expose the student to a range of the modalities with exposure to various staff and residents. Students are expected to attend the scheduled academic teaching sessions for the residents, held every Wednesday afternoon in the Spencer library in the department, near CT. On "bank day" weeks, these are held Friday afternoons. For each week of elective, the student is to submit an interesting case powerpoint presentation, using the template provided. This is not for a formal oral presentation, but is intended to stimulate participation in the department and will be kept as a record of attendance and participation. These cases will accumulate over time and a bank of teaching files will be available for future students. Thank you in advance to contributing to this project. Academic Faculty participates in the education of undergraduate medical students in several facets. This includes view box teaching of visiting elective medical students in the department. As well, the faculty participate in the JURSI academic Half-Day Teaching and Systems-based lectures. Further changes to the undergraduate component of Radiology education are being explored. The University of Saskatchewan Training Program in Medical Imaging is designed to provide the best possible training in all aspects of imaging. The program is an intensive one, with considerable emphasis on teaching, in addition to exposure to a large volume of clinical pathology. The university-wide integration and rotational system ensures that each resident will have access to all the strengths of our faculty and clinical pathology. Residents have the opportunity to train at modern hospitals. All hospitals are equipped with state-of-the-art equipment including CT, MR, biplane angiography, and PET/CT at Royal University Hospital. Residents work daily with the best of general radiographic, ultrasound, CT and MRI technology. All hospitals have digital image archiving and communication systems. The five year program consists of one year of preliminary clinical training (PGY1), followed by four years of training in medical imaging. All residents must be knowledgeable about the physics of medical imaging. To that end, intensive instruction is provided in each of the PGY2 and PGY3 years. Log in to Sharepoint with nsid and password. Restricted for Faculty and Residents of Diagnostic Radiology only. The program director is the head of the residency training committee. There are two resident representatives on the committee along with representatives from all the training sites in Saskatoon. This committee meets formally quarterly. More urgent topics are discussed on an as needed basis. There is a yearly day-long retreat for all residents (PGY1-5) with the program director. Other speakers/attendees are invited as needed. The PGY-1 year represents a broad clinical experience including a four week introduction to medical imaging. The current rotations include: ER, pathology, obstetrics, pediatrics, medicine and surgery. Two one-month elective blocks are also included. A rotation schedule is established that satisfies the requirements of the Royal College of Physicians & Surgeons of Canada in regards to the content of training. The program emphasizes providing sound training in general diagnostic radiology. The different rotations are spread throughout the years of the program allowing the resident to gain graded responsibility in each area as well as taking on an increasing consultative role. Elective attendance at AIRP is encouraged and will be financially supported. Elective experiences are also available at affiliated sites in Saskatoon, and Regina. This offers an opportunity to experience radiology outside of a tertiary care centers. An academic half-day program is offered weekly September-June. There is a formal series of 4hour weekly lectures or seminars for all residents, PGY1-5. Additional case-bases session occur weekly at the RUH site and about once or twice a month at the other sites in Saskatoon. Interdisciplinary rounds occur with orthopedics, rheumatology, neurosurgery, neurology, oncology, head and neck surgery and respiratory medicine at various times during the month. Journal Club meetings are organized by the residents and occur once a month. The residents are expected to undertake two complete research projects during their five years of their training. A broad range of types of projects can be performed, ranging from retrospective views through quality assurance, to prospective randomized clinical trials. It is expected that a question will be posed and subsequently answered through the process of research. If it is felt to be appropriate, presentation of materials at National or International conferences is supported by the department. Presentation at our local Resident Research Day is mandatory, but additional presentations are voluntary. The PGY-1 Residents attend the research day. Residents can click here to acces a complete document for research training objectives and requirements. All residents are evaluated continually with evaluation reports at the completion of each 4-week or 8-week block of training. These evaluations are summarized into compiled evaluation reports every 6-months, with formal promotion reports yearly. Objective assessment occurs with the use of oral exams yearly for PGY2-4. The PGY5 trainees receive an intense series of personal exams geared for exam preparation. All trainees (PGY2-5) participate in a yearly OSCE examination in the spring. All trainees (PGY2-5) write the American College of Radiology in-service examination. The Royal College of Physicians and Surgeons of Canada (RCPSC) objectives of training and specialty requirements that pertain specifically to research highlight the need to be able to critically appraise sources of medical information, in order to appropriately integrate new information into clinical practice and to be able to contribute to or collaborate in the development of new knowledge in the field of Radiology. Specifically, the resident will be required to be familiar with the development, execution, data analysis, interpretation and presentation of a research project by active participation in at least one research project during residency training, to understand the basic principles of basic and applied clinical research, , and to be able to critically appraise and summarize the literature on a given subject, and judge whether a research project or publication is sound, ethical, unbiased and clinically valuable. CanMEDS requires that completion of these objectives in each residency programme be formally evaluated using In-Training Evaluation Reports (ITERs) and Final In-Training Evaluation Reports (FITERs). The goal of developing these Resident Research Training Objectives was to standardize minimum resident research requirements in Canada. This document was developed through collaboration and consensus by all members of the Research Committee. The guidelines describe research requirements expected of all residents successfully completing residency training programs in Canada. The achievement of Level I is the standard requirement by a resident, while Level II may be achieved by some residents with interests in clinical, basic science or population health research. Time lines during residency to complete the different requirements are outlined. MRI research time will be formally offered at RUH beginning May 10, 2012 from 12:30pm to 4:00pm. This time will be reserved on every Thursday for either the 1.5T or 3T scanner (provided we have time to adjust schedule for other magnet accordingly – preferably 30 days). This time will be available for any approved MR imaging research, fMRI research, MR Proton spectroscopy research, animal research, etc. A certify MRI technologist will be available and will operate the scanner as directed and in conjunction with the researcher. Only SHR certified technologists will be allowed to operate the scanners. Onsite MRI safety for staff volunteer subjects and researchers will be the responsibility of the technologist. All human imaging subjects must read and sign a disclaimer before being imaged. All research will need REB approval from the University of Saskatchewan research ethics board as well as operational approval from the SHR before commencement of imaging. Exceptions could be made for acquiring limited initial pilot MR image data on proposed research as approved by RUH MRI medical lead Dr. David Leswick, RUH MRI research team, or designate. Initial validation for projects pre REB and OA may be provided without formal commitment, if requested. All attempts will be made to schedule research time at least 3 weeks in advance. Initial discussion and requests from researchers should be directed to Dr. Leswick or designate. Application for research must be completed and submitted. Operational approval may be needed and will be granted by RUH Medical Imaging Manager Darin Humphreys or designate. Communication to outside department heads regarding MRI research will be generated from the office of Dr. Paul Babyn, Head of Medical Imaging at University of Saskatchewan and Saskatoon Health Region. All researchers and assistants who will enter MRI zones III and/or IV are must complete and pass the online MRI safety program administered by SHR Quality, Safety and Informatics Manager Richard Dagenais and have site orientation done by a staff MRI technologist, supervisor, or trained MRI Radiologist. MRI department access security prox cards will not be issued to researchers at this time as they will always be accompanied by a staff technologist or radiologist. Complete and submit Application for magnet research time. These forms are available in MRI department or from any research team member. You will be contacted for discussion/scheduling/subject safety screening. If approved, and you will be directly assisting with imaging, you will be directed to complete MRI safety training before beginning project. 3T Siemens Skyra Tim + Dot 48 channel system with XQ gradients, 70cm bore. Dedicated coils for Head/Neck 20 ch, knee 15 ch, foot/ankle 16 ch, hand/wrist 16 ch, body matrix array 18 ch, peripheral array 36 ch, posterior spine in table coil 32 ch. H proton MRS-single and multi, SWI, DWI, TOF MRA/MRV, Phase Contrast MRA/MRV, CEMRA/MRV, ASL, Perfusion, Cardiac Argus processing, CSF and blood flow analysis, Parallel imaging, TIM CT (continuos table movement scanning with total body matrix combined). 1.5T Siemens Avanto Tim 76 x 32 with SQ gradients, 60cm bore. Dedicated coils for Head, knee, foot/ankle, wrist, body matrix array x 2, peripheral array for lower body. H proton MRS-single and multi, SWI, DWI, DTI, TOF MRA/MRV, Phase Contrast MRA/MRV, CEMRA/MRV, Perfusion, Cardiac Argus processing, CSF and blood flow analysis, Parallel imaging. fMRI protocols are currently under development, but not available at this time. The following CT examinations may be performed during the day or evening. At RUH we are currently operating a GE CT750 HD Scanner and a GE LightSpeed Ultra. The General Fluoroscopy department offers many clinical services including: arthrograms, aspirations, barium enemas, modified barium swallows, small bowel enemas, cleft palates, cholangiograms, esophograms, hysterosalpingograms, GI's, myelograms, sialograms, tube checks, VCU's, venograms and fluorocopically-guided joint injections and operative procedures . We are currently operating a Philips Radiography and Fluoroscopy unit and a Philips multipurpose c-arm fluoroscopy unit. 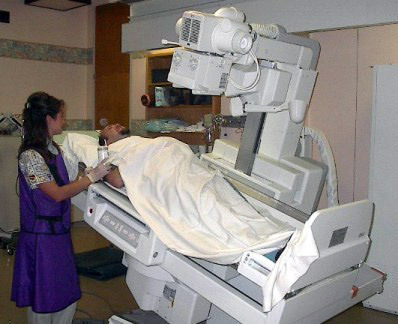 An x-ray machine sends a radiation beam through the body and demonstrates solid internal structures, like bone, organs and dense muscle tissue as an image for technologists and doctors to see. Several x-rays may be taken from different angles. X-ray images are processed and ready for evaluation shortly after the procedure.Some examples of radiology tests include all bone examinations, chest and abdomen images, examinations of the stomach and bowel (barium is used to visualize the organs), examination of the kidneys by injecting a contrast (dye) into a blood vessel. The MRI department at Royal University Hospital was opened in 1992 and continues to function as a clinical, teaching, and research magnet. New state of art 1.5 T MRI Units were installed at St. Paul’s Hospital in 2008 andSaskatoon City Hospital in 2011. The RUH facility currently occupies a beautiful new MR suite in the Potash Corp MRI Centre at RUH with both 1.5 and 3 T MRI Units. The RUH MRI offers clinical diagnostic services for many departments including but not limited to neurology, neuro-surgery, general surgery, orthopedics, ophthalmology, internal medicine, cardiology, emergency medicine, and oncology. We predominantly see patients from the Saskatoon Region, and the northern half of the province, but often we receive referrals from the entire province due to our affiliation with the medical college and the many specialists who practice here. The department is involved in the specialty training of Radiology residents and MRI technologists. We are currently operating a Siemens 1.5T and 3T MRI systems equipped and capable of doing high resolution neuro imaging, functional imaging, cardiac imaging, magnetic resonance angiography (MRA), spectroscopy, breath-hold abdominal imaging, magnetic resonance cholangio-pancreatography (MRCP), flow studies and analysis, and much more. Positron Emission Tomography-Computed Tomography (better known as PET/CT) is a diagnostic technique that incorporates both a PET camera and a CT scanner into one imaging device. Through this process clinicians are able to incorporate the strengths of a PET camera by looking at the body's cells at a molecular level while adding the anatomic accuracy of a CT scanner to pinpoint where disease processes are occurring. In essence, two exams are performed sequentially and the images from both modalities are fused together to give the interpreting physician a more comprehensive picture from both a molecular and an anatomical standpoint. When PET and CT images are combined, physicians can view the exact location and extent of disease, allowing for an accurate diagnosis and precise roadmap to guide treatment. PET stands for: Positron Emission Tomography The test begins with an intravenous injection of a radioactive sugar called FDG (fluorodeoxyglucose). The sugar shows up in areas of your body where the cells are more active or have a higher "metabolic activity" than normal. 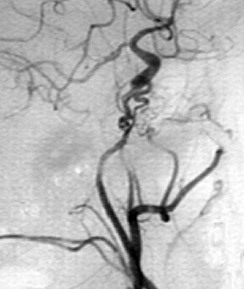 CT stands for Computed Tomography (a 3-D x-ray imaging technique). CT helps to localize the FDG uptake to specific anatomic structures. An abnormality detected by CT will be shown to represent active disease if the metabolic activity is high on the PET scan. Many normal cells like muscle and white blood cells also use sugar as fuel. CT will help to localize the FDG activity to normal or inflamed arthritic joints and avoid a misdiagnosis. What can I expect once I arrive? When you arrive, a technologist will review your information and answer any additional questions you may have. You will need to fast for several hours prior to the examination so that the cells in your body are able to take up the FDG (radiotracer). You should only drink plain water up until your appointment time to avoid dehydration. Initially your finger will be pricked and your blood sugar will be measured using a glucometer to ensure that your blood sugar is within acceptable limits for your examination. You will be weighed and an IV will be started in your hand or arm. You will then be placed in a warm dimly lit room and made as comfortable as possible. Next, a small amount of the radiotracer will be injected into the IV. The IV will be left in for the duration of the scan. You will NOT be able to listen to music, read, talk, or play video games, etc. It is important that you remain in a resting state and are stimulated as little as possible in order for the FDG (radiotracer) to be fully effective. You will remain in a room resting for approximately 45 minutes to an hour prior to your scan. When it is time for your scan, the technologist will ask you to empty your bladder just before your scan begins. You will lie on a comfortable table that moves slowly through a ring-like scanner as it takes the pictures. You may be asked to raise your arms or place them on your abdomen depending on what type of study you are having. It is important that you lie very still during your exam because movement can interfere with obtaining proper results. The first part of the procedure is a CT scan which will take about 30 seconds. The PET scan takes on average an additional 30-45 minutes. Both procedures are performed on the same machine. Once your images have been checked to ensure that all information is of diagnostic quality, you will be free to leave. Plan to spend about 2 hours with us, from the moment you arrive until you are ready to leave. This time will vary slightly depending on the type of examination you are having. You may leave as soon as the exam is completed. If you received a sedative prior to the exam, you must have a pre-arranged ride home. You will be able to eat and drink immediately after the exam. Drinking fluids is encouraged to remove any FDG from your system. The nuclear medicine (PET) specialists will review the images from your PET/CT and send a report to your referring doctor. Contact your doctor for your results of the PET/CT. If you have questions about a PET/CT that has already been booked call (306)-655-3340. If you have any other questions contact your physician. What are the risks associated with FDG PET/CT? The amount of radiation you receive from a PET scan is comparable to any other radiography procedure such as a CT or Bone Scan. You will be slightly radioactive for several hours so you should stay 5-6 feet away from an infant, or anyone who is pregnant after you leave. You may interact freely with other adults. FDG will no longer be detectable in your body after 24 hours. If you are pregnant or breast feeding you should inform the imaging staff BEFORE the examination is performed. You can expect to be in the PET/CT department for approximately 2-3 hours. It's important you arrive 30 minutes before your child's appointment. When you arrive your child will be checked in to the department, then a technologist will interview you and your child to ensure that all the conditions have been met to proceed. An intravenous will be set up and then some radioactive material called FDG will be injected and allowed to work in the body for about an hour. The actual scanning portion of a PET/CT exam takes approximately 30-45 minutes. What if my child won't hold still for the 45 minute scan time? If a child is under the age of 5 or you know they will not be able to hold still for the scan we may need to arrange sedation for your child. This is something you can talk to your physician about or you may contact us at (306) 655-3340 and we advise you on a course of action. Is it dangerous for my child to get this scan? What preparation does my child need to do before coming? Your child needs to be fasting the morning of the scan. This means no food or drink is allowed but they may have as much water as they want. Things such as gum and cough syrup are not allowed as well. Strenuous activity should be avoided for 24 hours before the scan. Being cold right before coming to the scan can interfere in obtaining proper results so if it is winter pre heating your car before coming and wearing warm clothing can make the images turn out better. Dress the child in comfortable clothing avoiding metal snaps or zippers. This can interfere in obtaining proper results. After arrival we may need them to change into a hospital gown. If your child is diabetic please contact us as we may need to issue special instructions. The day before the study it is important to have a low carbohydrate, low sugar diet. This means things like potatoes, rice and candy should be avoided. Things high in protein like meats and cheeses are good to eat. Can I stay with my child for the scan? You should be able to be with your child almost the whole time they are in our department. The only time you may be asked to leave is when the CT scanner is going but this takes only about a minute and you would be able to return to your child’s side after this. How do I let my child know what is happening before the test? Before the test talk to your child about what they can expect. For young children, use simple words and explain only shortly before the test is scheduled to start. Some children are most afraid that we need to give them a needle so you may want to avoid telling them that before they come. This is dependant on your child, you know them best. Please refer to Patient Information & Instructions for PET/CT Examination to obtain diet instructions prior to your PET/CT examination. The PET/CT department at the Royal University Hospital is equipped with a Discovery 710 PET/CT scanner from G.E. Medical Systems, the first of its kind to be released in Canada. The new facility has the ability to provide PET scans with diagnostic contrast enhanced CT, as well as PET/CT with radiotherapy planning. There is also the opportunity to provide certain types of cardiac, and neurological imaging as well. Referrals are accepted according to clinical indications set forth by the medical requisition located in the link below. 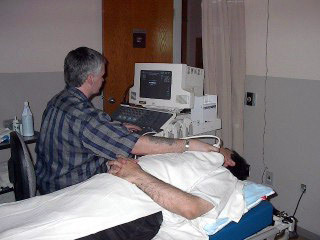 Ultrasound is a complex, versatile and non-invasive medical imaging tool. It is the detection and display of acoustic energy reflected from soft tissue interfaces within the body. These reflections provide the information needed to form high resolution gray scale images of the body and the study of blood flow. This images are obtain by highly trained credentialed sonographers using a combination of skills such as; knowledge of the physical principles of ultrasound and good understanding of pathology, physiology and anatomy. The examinations offered by the ultrasound department include; abdominal and small parts, muculoskeletal, obstetrics and gynecological, vascular, urological, trans-cranial Doppler and pediatrics. There are five state of the art ultrasound units in the department at Royal University Hospital, three Philips IU22; one Spencer Technology for trans-cranial Doppler studies and one Zonare portable unit. At RUH we are currently operating a Philips, Allura Xper, bi-plane, digital detector, fluoroscopy unit. Medical Image Solution for Teaching and Research. The solution in its current incarnation, in broad strokes, is an online electronic systems that would include the following capabilities: provide faculty with electronic capability to develop teaching case files based on DICOM images from local radiology equipment. Provide students with the capability to study cases and train and provide summative assessment of learning. Provide researchers with the capacity to pull DICOM images and data from existing repositories and equipment to develop a database of clinical cases for research purposes. Capability to display DICOM (w/full control) and non-DICOM images. Include the ability to store meta-data, case history and other medical information that aid in differential diagnosis. Must be accessible via a secure connection through the web (HTTP) or (HTTPS). Must preserve all DICOM capabilities. Anonymize patient information to protect confidentiality. Closely mimic clinical systems in look and feel and capability. The purpose of this wiki is to provide instructions and help for the MISTR Tool suite.